St. Bridgets’s church is located in Chapel Grove on the Kingston Peninsula. St. Bridget’s Church built 1872-1873 and was served by the Redemptorist Priests from St., Peter’s Church in Saint John from 1887 - 2006, and is now served by the Roman Catholic Diocese of Saint John. 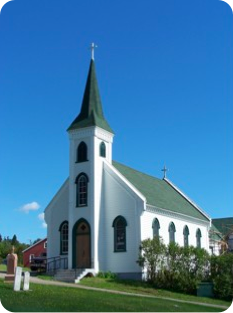 People may be surprised to find that St. Bridget’s is older than St. Peter’s in Saint John. Prior to the erection of the present Church, a log chapel known as “Etchingham’s Chapel, St. Bridget’s served the Catholic community of the Peninsula.